Around this time of year, a number of London stations are in the news for the considerable amount of work that is on-going for rebuilding, the creation of new lines and what always seems to be the inevitable overrunning engineering works. The work at London Bridge and for Crossrail being just two examples. Major schemes have always been in various stages of planning to address London’s ever increasing transport requirements. Some schemes have reached completion, others never moved from the conceptual stage. 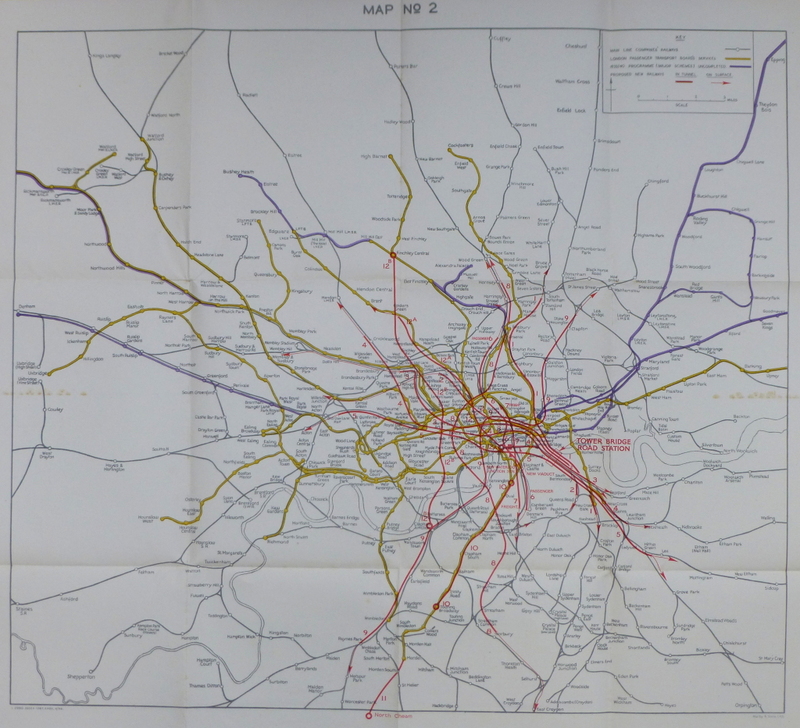 For this week’s post, I want to illustrate one set of schemes that were published in January 1946 and show how usage of the main London stations has changed over almost 80 years. In the middle of the last war, there was a general feeling that the tide was starting to turn and planning could start for what London would look like in the decades after the war. How could the city be developed, what would be the transport needs of Londoners in the future, how could both the city’s infrastructure and landscape be improved and better use made of the limited space available? 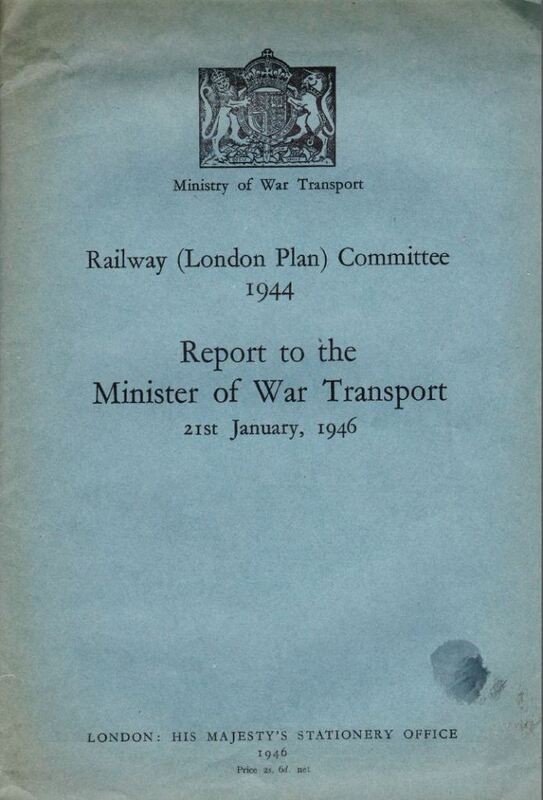 The report from the committee was published in 1946 and made some very far-reaching proposals, that had they been implemented would have had a dramatic impact on the transport system we see in London today. Before getting into some of the details of the proposals, it is fascinating to compare the use of London stations between the 1930s and today. The 1946 report details passenger numbers of all mainline terminals up to the end of 1938 , the latter being the last year free from the influence of war. Whilst overall numbers have increased considerably there are some fascinating individual station comparisons. I bet if you use London Bridge on a daily basis the fact that in 2010 passenger numbers were still slightly below the 1938 level is of little comfort. Perhaps reflecting the different options for transport and the changes in home locations for those working in central London, there are some significant swings. Paddington, Euston, St. Pancras, Waterloo and Victoria all showing significant increases in passenger traffic whilst King’s Cross, Liverpool Street, Charing Cross, Cannon Street and London Bridge are all showing reductions. There were a couple of major themes within the 1946 report, perhaps reflecting the “anything can be done” attitude needed during the war, and a realisation that the changes caused to London by heavy bombing presented a major opportunity to improve London for everyone who lived and worked in the city. A similar approach to that taken by Wren after the Great Fire of 1666 when he proposed the creation of a city more along the lines of Paris than London had been with an ordered city with straight boulevards and a logical planning approach rather than the numerous small lanes and alleys of pre-fire London . The construction of an extensive series of deep level tunnels and interchanges to replace the above ground infrastructure and to provide improved passenger and freight transport across London, capable of meeting the expected increase in both freight and passenger volumes. As well as the removal of the bridges across the Thames, the viaducts across south London were also seen as a problem. Not just as a wasted space, but that they also split communities and their replacement by tunnels was seen as a way of integrating the many communities of south London. This was one of the areas where the rebuilding of the rail system would contribute into the overall London plan by making redevelopment of large areas such as the South Bank possible without the extensive railway infrastructure across the area. In these proposals it is also possible to see the ideas behind Crossrail where trains from outside the immediate underground network are routed in tunnels across London with deep level interchanges with the tube and other rail networks and with the surface. Whilst the destinations are different, the concept is the same. Project B: A new deep level-loop connecting Waterloo Junction, Charing Cross, Blackfriars, Cannon Street and London Bridge and then by tunnel via the Surrey Canal rising to join the existing surface systems in the south and south-east. Project D: A northern arc suburban passenger route, passing below the main line stations at Paddington, Marylebone, Euston, King’s Cross and Liverpool Street with interchange facilities. One of the other projects considered for the rail terminals was “The reconstruction of terminals at two levels, with flat roofs for future air landing”. Just shows the difficulties in trying to forecast how transport will be used in the future. Removal of the bridges across the river was considered important as “the merit of a clean sweep of the three rail bridges over the Thames between Westminster and London Bridge cannot be denied”. How different the river would look today without the rail bridges. Decentralisation of employment, for it is one of the guiding principles that industry also should be de-centralised and there are proposals for satellite towns to be located, and existing towns expanded beyond the green belt. These words could equally have been written in 2014 as they were in 1946, and in 2014 to support the second point could also be added the ever-increasing price of property in central London driving people further out in search of affordable housing. London Bridge Station was singled out for special interest. Total passenger numbers in the peak hour in 1925 was 38,000 and grew to 55,000 in 1938. In planning the proposed changes to the rail system, an expected 75,000 passengers was considered the level for which an upgrade should be planned. The following map shows the first and second priority routes and also tunnels for the use of passenger and freight traffic. This was still at a time when significant volumes of freight traffic were carried by rail. The explosion of road transport, the motorway network and the considerable use of lorries for freight was not forecast to have a major impact on the rail system in 1946 (again click on the map to open a larger copy). This was rounded up to £50 Million, which was then doubled to take into account the cost of land, property, traction equipment, rolling stock and signalling, plus a further £10M for other ancillary works, giving a total estimated cost of £110 Million. A considerable sum just after the war, also given the financial situation of the country at the time. The cost of all proposals in the plan was estimated at between £228 Million and £236 Million and these costs did not include the cost of electrification or any other works outside of the proposed tunnels. Estimates of construction time were “under the most favourable conditions, would not be less than 30 years”. New types of train were also recommended. The majority of overland trains on the Southern Railway comprised carriages with six-a-side compartments, however the safety needs of operating these trains underground required the provision of rolling stock with some form of through corridor to enable passengers to pass in emergency from one coach to another. The types of trains in use at the time were made up of six-a-side compartments and an overall train could carry 1,050 passengers. A 10-coach train of similar length with through corridors reduced passenger carrying capability down to 600 passengers. A challenge with the proposed approach as an increase in the number of trains would be required to carry the same number of passengers without any capacity for the expected increase in numbers. So what happened to these proposals which would have had a very dramatic impact on the train services and stations in London as well as the view along the Thames if the removal of the rail bridges had gone ahead? As well as the very significant costs of the proposals, shortly after they were published alternative committees were also set-up to look at options for upgrading London’s transport services. 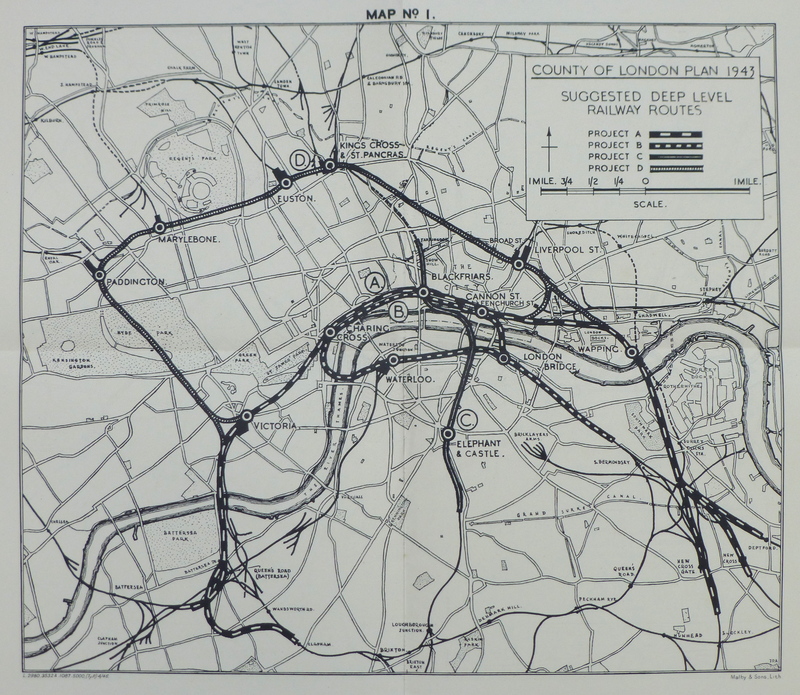 London Transport planners also prepared their own report which was published the following year in March 1947. On the 1st January 1948, the British Transport Commission took over London Transport as well as the main line railways. The Commission also set-up a new working party to report on transport services within London and a report was completed in late 1948. 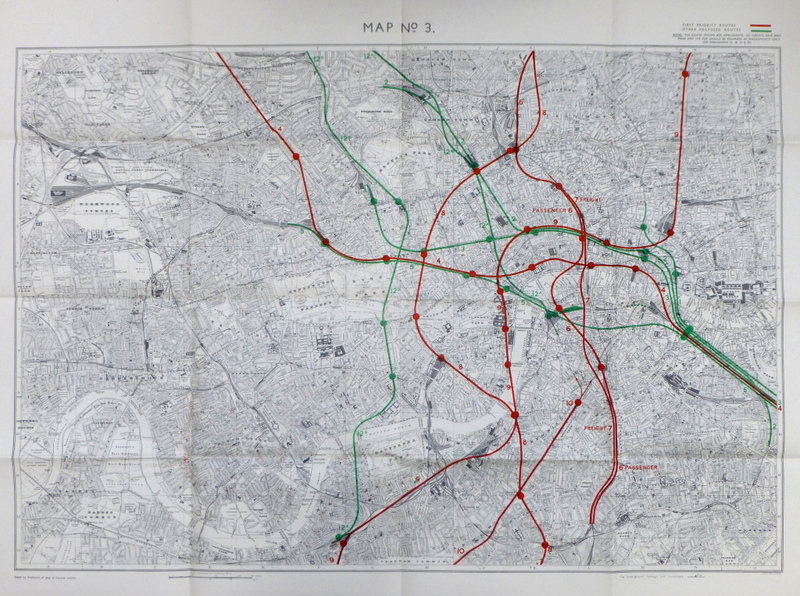 The multiple reports, high costs and the economic state of the country in the late 1940s and early 1950s put on hold this type of far-reaching proposal and development of transport within London followed a more individual project approach. Some of the 1946 proposals did get included in alternative projects. For example the Brixton branch proposed in 1946 was eventually covered by the routing of the Victoria Line to Brixton. London Bridge Station in all it’s complexity is still there and perhaps after the ongoing considerable rebuilding work including the work over this year’s Christmas break, will see the station reach the potential envisaged by the 1946 planners, although with the significant difference of being above ground rather than below. This entry was posted in London Transport and tagged Cannon Street, London Bridge, London Transport, Railways, River Thames on December 28, 2014 by admin. Liverpool Street’s numbers have declined, because the Central Line opened to Stratford (etc) just after the War. Huge numbers have transferred there ever since & this will increase with the Lizzie-line. Map 1 doesn’t show the same schemes as Maps 2 and 3. The concept in map 1, noted as a 1943 plan, is to loop the various Southern lines through and around central London, then back out again to join another Southern line, not physically connecting to northern networks at all except for a single north-south Thameslink equivalent. This, I suppose, makes sense to preserve a balkanised 3rd rail land and as such I suspect it may have been more a Southern Railway plan than something considered on a broader scale. The other, presumably later, maps show a complete series of different schemes, all proto-Crossrails as we’d term them them today, although none following particular routes built or proposed later I believe, except the north-south Thameslink axis which seems to be a recurring theme. The interesting change to the Thameslink axis on the later maps is a little wiggle via Waterloo. This clearly adds major connectivity to the whole south west quadrant of London and further afield along the LSWR network that is still missing from Thameslink’s interchange map today, despite the lines being so tantalizingly close just south of Blackfriars. I know there have been previous proposals for a set of Blackfriars platforms on the Waterloo & City to achieve this, dismissed as impractical for various reasons, but there might be another option to create a completely separate people-mover connection between Waterloo and the South Bank entrance of Blackfriars, perhaps built partly above and alongside existing tracks, but using a different technology to conventional rail that can negotiate tighter curves and steeper gradients to fit in the confined spaces without (much) demolition. A thought on those South London railway viaduct removal justifications, to re-connect urban communities etc. It is quite likely that would all have been forgotten a decade or so later when highway planners were envisaging their vast new urban motorway networks. It would have been rather handy for them to be able to get their hands all those nice clear ex-railway alignments to build on throughout South London! The “obvious win” of closing Charing Cross and creating 4 through lines from Waterloo to Waterloo East seems to ever be overlooked. The Kings Cross figures are interesting as until the development of Thameslink LKX was not a main commuter destination. Commuter lines ran in to Kings Cross York Road but many of the trains then disappeared along a tunnel to additional stops at Farringdon, Barbican and Moorgate.